← From Where Does That Word Come? After years away from England, members of the REALM return home to claim the titles and the lives they previously abandoned for selfish reasons. Each man holds onto the fleeting dream of finally knowing love and home. For now, all any of them can hope is the resolution of the difficulties which drove them from England before their old enemy Shaheed Mir finds them and exacts his revenge. Mir seeks a fist-sized emerald he believes one of the REALM stole from him. 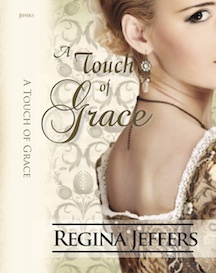 My favorite book of the series is Book 4, A Touch of Grace. In the series, I often refer to Gabriel Crowden, the Marquis of Godown, as an “Adonis.” He is a rake about Town, a man who does not trust women until he meets Miss Grace Nelson. Grace’s brother gambled away his fortune, and she must take the position of a governess. While the whole world recognizes the “handsome countenance” of Godown, no one notices Grace. As a defense against the world in which she is thrust, Grace developed the art of being invisible. She wears nondescript clothing, spectacles with plain glass in the lens, and slicked backed hair in a simple do. From the moment they meet, Gabriel recognizes a beauty to which others are blind. One of favorite lines in the story occurs when Grace delivers a message of warning to Godown’s Town home. His butler brings Godown the message. Gabriel bit back his first retort. Instead, he said, “Does no one else see this woman except me?” It was true, only Godown recognizes Grace’s true beauty – her true worth. One of the things I love about Grace is her resilience. She survives where others would fail. Despite loving her beyond distraction, Godown treats her poorly. Even so, Grace risks her life and that of her unborn child to save Godown’s elderly aunts, as well as the marquis himself. When Godown rejects her, Grace disappears into London’s underbelly with a plan to survive without the man she adores. What is most frustrating to Godown when he comes to his senses is the fact that he knows that no matter how hard he searches for Grace so he might beg her forgiveness, he will not find her unless Grace wishes to be found. Where his life is nothing without her, Grace can claim success in the knowledge of her ability to persevere. GABRIEL CROWDEN, the Marquis of Godown, easily recalled the night that he made a vow to know love before he met his Maker. Needless to say, that was before Lady Gardenia Templeton’s duplicity drove Godown from his home and before his father’s will changed everything. Godown require a wife to meet the unusual demands of the former marquis’s stipulations. Preferably one either already carrying his child or one who would tolerate his constant attentions to secure the Crowden line before the will’s deadline. GRACE NELSON dreams of family died with her brother’s ascension to the barony. Yet, when she encounters the injured Marquis of Godown at a Scottish inn, her dreams have a new name. However, hope never takes an easy path. Grace is but a lowly governess with ordinary features. She believes she can never earn the regard of the “Adonis” known as Gabriel Crowden. Moreover, the man holds a well-earned skepticism when it comes to the women in his life. How can Grace prove that she is the one woman will never betray him when the marquis believes she is part of a plot to kill him? 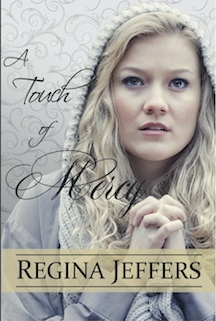 Grace’s younger sister, Mercy Nelson, is the heroine of Book 5 of the series, A Touch of Mercy. When Grace leaves her brother Baron Nelson’s manor to become governess to the Averette household in Edinburgh, Mercy is left alone to fend off the attentions of Nelson’s associates. Her brother decides to marry Mercy off to a much older man, who has five children by his previous wife, in order to pay off the baron’s debts. When the household receives word of Grace’s likely demise, Mercy runs off to find her way in the world. Mercy, who is five years Grace’s junior, is barely nineteen when she leaves Lancashire for London. Fortunately, she encounters Henry “Lucifer” Hill, the man of all trades to Aidan Kimbolt, Viscount Lexford. Hill gets it in his mind not only to assist the girl to safety, but to play matchmaker to Lexford and Mercy. Hill stages a farce where he introduces Mercy as Aidan’s half sister, the product of an affair his father had years prior. The viscount’s history is one of the more bizarre ones that I concocted, so much so that one of my friend’s called one evening to say tearfully that I should have warned her of what occurred to bring a minor son to the viscountcy. As typical of the youngest child in a family, Mercy views Grace’s efforts to thwart the debauchery of their elder brother as adventurous and courageous. Mercy wishes to imitate Grace’s stance, but in a more rebellious manner. Unlike many “babies in the family,” Mercy is not spoiled or manipulative. She has not experienced the luxury of such traits. The men with whom her brother/guardian associates are crude thieves, who mean to have Mercy in their bed long before she is of age. What I like about Mercy is that she is a quick learner. As the youngest, first her parents and then her older siblings made decisions for Mercy. When she begins her adventure, she is less sure of herself and more naïve than was Grace, but when Mercy meets Aidan Kimbolt, she takes on his troubles as her own, and in the process grows into a vibrant, decisive woman. The viscount holds the power of his title, but his personal life is in total disarray. The encounter provides Mercy the opportunity to prove herself worthy. A devastating injury robbed AIDAN KIMBOLT, VISCOUNT LEXFORD, of part of his memory, but surely not the reality that lovely Mercy Nelson is his father’s by-blow. His “sister’s” vivacity intrigues Aidan. She ushers life into Lexington Arms, a house plagued by Death’s secrets – secrets of his wife’s ghost, of his brother’s untimely passing, and of his parents’ marriage: Secrets Aidan must banish to know happiness. Fate delivered MERCY NELSON to Lord Lexford’s door, where she quickly discovers appearances are deceiving. Not only does Mercy practice a bit of her own duplicity, so do all within Lexington Arms. Yet, dangerous intrigue cannot quash the burgeoning passion consuming her and Viscount Lexford, as the boundaries of their relationship are sorely tested. How can they discover true love if they must begin a life peppered with lies? However, Lucinda’s life is far from easy to set aright. Her late husband kept another wife, a first wife, in fact. A first wife who was of Jewish extraction and who bore the late Captain Warren a son. Not only is Lucinda’s marriage a sham, but so is everything she knew of her husband. When the child mysterious appears on Lucinda’s doorstep, she is forced to learn more of Captain Warren’s actions when he served with Wellington’s forces. This journey places her in danger, so much so that she must turn to Sir Carter for safety, but will the baronet recognize her for who she really is? Lucinda is the only child of a career military man, a minor son of the Earl of Charleton. She and her mother followed the drum during the war years. She is a very private person and not willing to accept the assistance of others. As such, Lucinda never experienced the closeness of female friends. In A Touch of Velvet, Velvet Aldridge is jealous of Lucinda because Mrs. Warren can speak freely with men. Why not? She has known nothing but her father’s officers since she was but a child. Lucinda’s lack of social skills are compounded by her husband’s “under my thumb” attitude. She thought Matthew Warren was simply protective of her, when in truth, he possessed a controlling personality. Lucinda acts meek in large social situations for her husband conditioned her to an “eyes cast downward” sort of woman. If I were to label her, Lucinda is a bit of an introvert. Introverts are more easily conditioned than are extroverts, and she is uneasy in large social situations. Even so, when push comes to shove, Lucinda is the first to react. She saves Sir Carter twice during their encounters. She is quite self sufficient, but Lucinda is inherently alone (as is Sir Carter), which makes them the ideal match. Aristotle Pennington has groomed SIR CARTER LOWERY as his successor as the REALM’s leader, and Sir Carter has thought of little else for year. He has handcrafted his life, filling it with duties and responsibilities, and eventually, he will choose a marriage of convenience, which will bolster his career; yet, Lucinda Warren is a temptation hard to resist. Every time he touches her, Lowery recognizes his mistake because his desire for her is not easily assuaged. To complicate matters, it was Mrs. Warren’s father, Colonel Roderick Rightnour, whom Sir Carter replaced at the Battle of Waterloo, an action which named Lowery as a national hero and her father as a failed military strategist. LUCINDA WARREN’s late husband left her to tend to a child belonging to another woman and drowned her in multiple scandals. Her only hope to discover the boy’s true parentage and to remove her name from the lips of the ton’s censors is Sir Carter Lowery, a man who causes her body to course with awareness, as if he etched his name upon her soul. Fate’s cruel twist throws them together three times, and Lucinda prays to hold off her cry of completion long enough to deny her heart and to release Sir Carter to his further: one to which she ill never being. This next heroine is not a traditional English lady. In fact, Miss Arabella Tilney is an American hoyden, who always, literally, trips over her own feet. Other than rain storms, few things fluster Arabella. She is practical and decisive and everything Lawrence Lowery, Lord Hellsman (Sir Carter’s older brother) needs in his life. Lowery is a dutiful son, so dutiful that he is isolated from all the spontaneity that Arabella offers. In the novel His American Heartsong: A Companion Novel to the Realm Series, Sir Carter assists Lawrence to a relationship with the one woman his brother cannot ignore. Lawrence Lowery makes a brief appearance in A Touch of Velvet. His proposal to Arabella is part of both A Touch of Mercy and A Touch of Love. 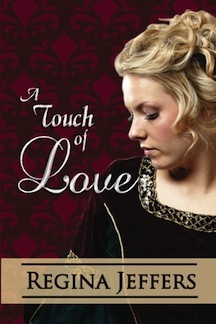 Arabella becomes Lucinda Warren’s dearest friend in A Touch of Love, and the stories are all connected in some manner. Lawrence calls Arabella “Mouse,” for she darts about with excessive energy, and she cowers with a squeak when a thunderstorm approaches. She knows horses better than most men, and she rides with confidence. Bella also has a working knowledge of roots and herbs and their medicinal values. She can beat most men in a game of chess. Her dancing is more exuberance than grace, and the woman possesses a quick temper and a tongue to pronounce all of Law’s faults. Bella accepts Law’s attentions because she considers him a friend, for she is lonely in a country to which she holds little knowledge or allegiance. Yet, when difficulties arrive, it is Arabella that Law wishes in his corner. She is not only quick to act, she is quite intelligent. Arabella’s parents are both English born, but, even so, Arabella feels a bit out of place. She is the eldest of two daughters. Bella’s mother was once a lady in waiting to Queen Charlotte, but her parents’ previous connections to the English aristocracy remain thin. With her mother’s passing, Bella and her younger sister Abigail are sent to England to make their debut, along with their cousin Annalee Dryburgh. Bella’s father is a successful breeder of thoroughbreds in Virginia. LAWRENCE LOWERY, Lord Hellsman, remains the dutiful elder son of Baron Niall Blakehell; the baron groomed Lawrence for the future, but his father never considers any of Law’s wishes. When Blakehell arranges a marriage with the insipid Miss Annalee Dryburgh, Lowery must choose between his responsibilities to his future estate and the one woman who makes sense in his life. By Society’s standards, MISS ARABELLA TILNEY is completely wrong to be the future baroness. Althoug Bella’s mother was once a lady in waiting to the Queen, Arabella is an American hoyden. She is everything her cousin Annalee is not, and Bella demands that Lowery do the impossible: Be the man he always dreamed of being. Will Law choose love or duty? 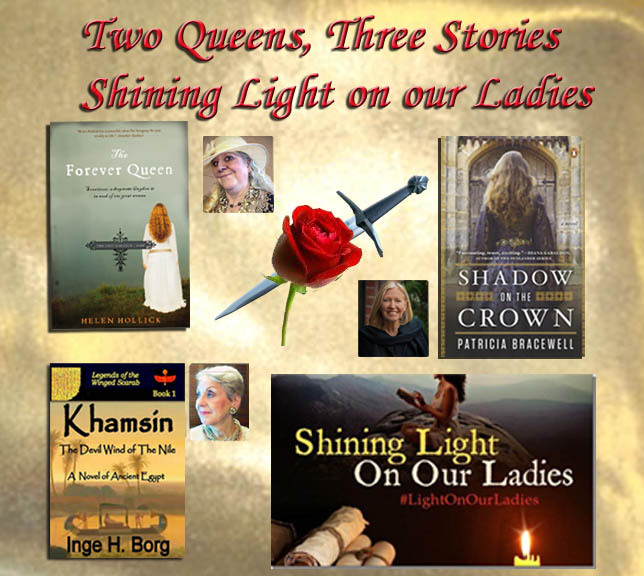 These are the first of the heroines of the REALM. Do you see someone who interests you? What about the women do you find admirable? Leave a comment below to be a winner of one of two eBooks available: Winner’s choice of any one of these four books. The giveaway will end at midnight, Monday, October 12, 2015, EST. 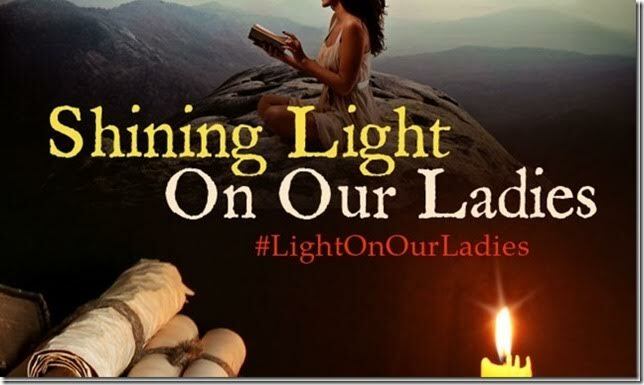 Please visit the other “Shine Light on Our Ladies” blogs for this day. This entry was posted in British history, Great Britain, heroines, Living in the Regency, Realm series, Regency era and tagged " "His American Heartsong, A Touch of Grace, A Touch of Love, A Touch of Mercy, heroines, Historical Romance, Realm Series, Regency England, Regency Era, Regency romance. Bookmark the permalink. Thanks for joining me today, tgruy. Annie, there is a tender story of the very young Lawrence Lowery keeping a pet mouse in his quarters at school. A correlation exists between the long-ago pet and his feeling for Bella. I’m interested to know more about Lucinda Warren and how she learn to cope with the truth of her husband’s child. So if I do win, I would like to have an e-book of A Touch of Love. Lucinda proves to be a match for Sir Carter’s daring, Sylvia. What a fascinating concept – and the characters are so intriguing. Another on my TBR list!